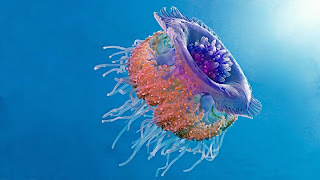 Jellyfish is one of the most common among all the sea creatures. Jellyfishes are marine invertebrates with no proper brain or a liver. These creatures belong to the phylum cnidaria. Though there “-fish” suffix with the name, biologically they are not even close to a fish. They are actually very primitive animals. That’ why there body is not a complete one. So, how does a jellyfish live without a brain? Read below to know. N.B. : Some people believe that a jellyfish has four brains. The reason of that peculiar belief is the four visible organs inside a moon jellyfish "head". But these organs are gonads, not brains. A brain is a central nervous system which controls the activities of the organs and behavior of an animal. It is a coordinator center of all nervous activities. There is not any such system in a jellyfish. What does a jellyfish have instead of a brain is a network of nerves. There is no central nervous system so there is no processing of data. These neurons help them to detect water temperature, chemical composition, presence of other organism, light, vibration etc. How Do Jellyfish Function Without A Brain ? A jellyfish has an organ named statocyst which helps it to balance itself. It works without a brain. It is a bag like thing with a ball inside. There are sensory hairs inside the bag. 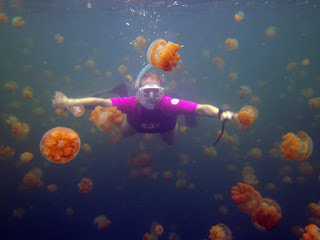 If the jellyfish becomes upside down, the ball will also go to the opposite end of the bag. So, it will trigger the sensors there. It means the jelly is upside down. 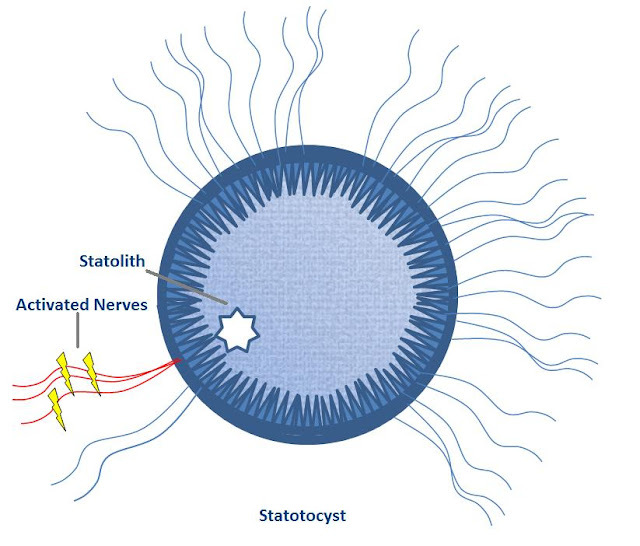 The statocyst will send signals to the jellyfish body to reorient itself. The mineral ball is known as statolith. Jellyfish does not have any true eye. They have eyespots or Ocelli. A developed eye is a stereoscopic camera. Jellies do not have such advanced eyes. Ocelli or eye spot is nothing more than a simple light detector. It cannot form images. So, a jellyfish cannot “see” anything or it does not have a “vision”. Some species like the box jelly has a more complex system. A box jelly has 24 eyes. It has 360 degree “vision”. These eye spots are attached with a gyroscope like organ. The gyroscope helps the jelly eyes to “see” everything from every angle. Due to lack of a central decision making organ, i.e. 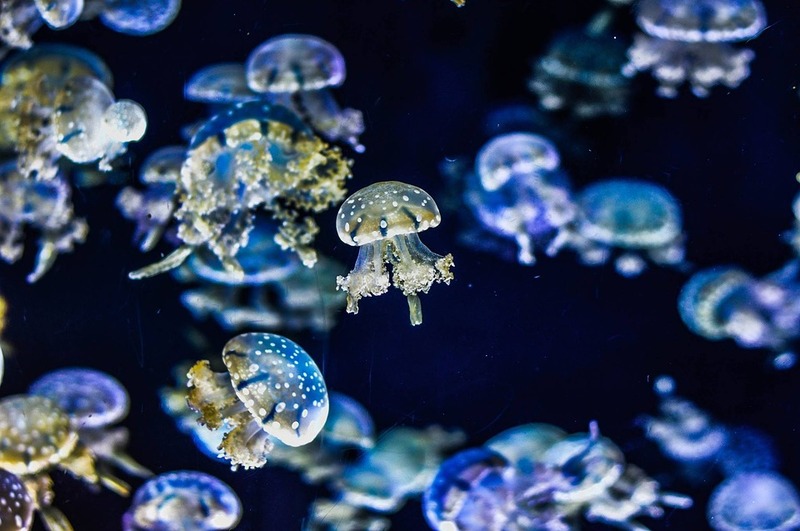 a brain, jellyfish has an automatic defense mechanism. There are millions of stinging cells or cnidoblasts covering the tentacles. The cnidoblasts are like nature made cartridges. There is an arrow shaped “bullet” in each cell. The arrow like thing is powered by a coiled spring. There is a hair like trigger or cnidocil. If the trigger is activated, the arrow blasts out and impales the target. There is a chemical detection system attached with the stinging cells to find out the prey or enemy to sting. It can detect the touch of a living cell of another animal. The chemosensor cells give signal to the adjoining nerve cells. The nerve cells then give the order to “fire”. 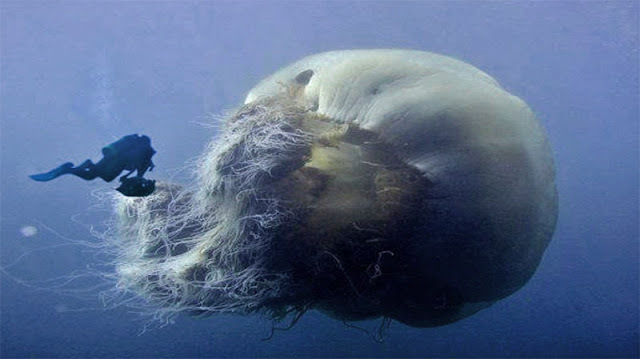 As you can see the defense mechanism of a jellyfish does not need a brain. Everything is automatic here. Due to the automation, a jellyfish can’t decide whom to sting and whom not to. How Do Jellyfish Move If They Don't Have a Brain? Jellyfish can’t decide where to go as they have not a brain. These creatures are big planktons. They drifted with the ocean current. They go where the current take them. Within a area of the ocean they can move a little. Jellyfish moves by expanding and contracting their bell. There movement is controlled by external factors like light, temperature, water flow etc. Jellyfish is the most energy efficient swimmer of the ocean. Jellyfish can’t hunt actively for not having a brain. They float and swim from one area to another of the ocean. There feeding depends upon chance. The long tentacles are used as a net to catch prey. It can’t chase anything. 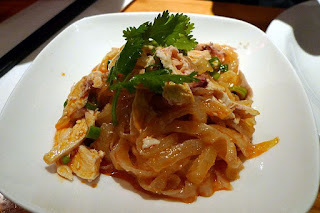 The food item must touch its tentacles to be pierced by the stinging. Jellyfish does not need to love or care for their partners. They don't need a mate for breeding. The mature males simply release sperms in the sea water during the period of mating. The females receive the sperms from water and get pregnant. It is a mechanical process without involvement of any kind of emotion. So, a brain is unnecessary here.